Few words in business are more widely used than the ubiquitous “strategy.” This convenient label may be attached to almost any collection of our ideas in order to impart gravitas to their meaning. And yet, so often, those strategies consist of little more than a set of goals or targets, a loose sense of our direction of travel, or — worse still — an expression of unsubstantiated hope. It is surely time to tighten up the definition of such an important component of the business lexicon. A practical definition of strategy might be “a plan to achieve an objective.” Under this interpretation, it is clear that specifying the objective, or desired future state, is essential. However, the starting point, or current state, also needs to be clearly understood. If a strategy is a plan to get from “A” to “B,” it is surprising how little attention is often given to the true characteristics of Point A. You would not get very far using a map with this approach, and in business, the understanding of Point A requires considerably more than pinpointing your current physical location. Imagine the following situation. A stranger approaches you with a map, asking you to explain the most effective way to get to his destination. You find your current location on the map and point out the roads that offer the most direct route. The stranger shakes his head and asks you to try again. You quickly spot your mistake; he obviously does not have a car. Your new plan involves a series of train connections. Another shake of the head. Thinking now that he may be a little short of funds, you ask him how much he wishes to spend on his journey. “Nothing at all,” is the reply. You eventually ask him to explain what he really has in mind, and his answer immediately clears up the mystery — he is leading a charity walk. The advice he needs from you is to show him the most attractive route for 30 walkers through remote countryside, avoiding the large towns and main roads. In business, too, strategies can miss the mark because we have not fully understood the context. The five headings in Figure 1 encompass the ground that should be covered to develop a robust strategy. In business, context is vital. The long-term history of acquisitions, disposals, major initiatives, people movements and financial performance often contains valuable insights about the current state of the business and the reasons for change. Motivation and the proposed speed and direction of travel have a lot to do with history. Relating the performance of your and competitors’ businesses to the correct market segmentation and share can reveal a great deal about Point A that really matters in a strategic context. We generally find that the work involved with correctly characterizing this starting position can absorb up to 70% of the effort required to formulate strategy. In contrast, the definition of Point B can be relatively straightforward. The shareholders, board, CEO and senior management will generally have discussed the ambitions and expectations for development over at least the next five years. Simple objectives can be powerful: Doubling the size of the business, achieving a market-leading position, and raising margins to levels attained by competitors or by the business itself in the recent past are all valid goals. The more difficult task is to ensure that these objectives have taken into account both the context (as above) and the means available (see below). Detailed milestones and metrics associated with individual initiatives are essential in activating strategies (see L.E.K. Consulting’s Executive Insights on Value Activation), but you also need clear and simple mechanisms for measuring progress toward your objectives at the higher strategic level. How will you know when you have arrived at your destination? What metrics would reassure you that you are on track during the journey? If the objective itself is defined as a measurable target, setting milestones simply means deciding on the timing of progress along the way. The milestones for more qualitative objectives, such as “developing a reputation as a technology leader in our field,” generally require more thought. Without measurement, a strategy loses its power to engage. The means available to pursue a strategy often receive too little attention. What strategic assets do you possess? The only steel plant in the country? Oil or gas fields with the lowest cost of production? A set of prime retail locations in every major conurbation in the country? The majority of valuable slots at a congested hub airport? Strategic assets open up valuable opportunities not available to competitors, and thus they alter the range of options that can be pursued. They may also require investment to maintain or protect, which might limit alternative development paths. A thorough review of competences in these three areas will inform both the objectives set and the strategies to attain them. Companies often make the claim that “people are our greatest asset,” while doing little to check the veracity of that statement, maintain the asset or improve the quality of the talent pool. More time is spent translating a strategy into financial projections than is spent attempting the more difficult task of forecasting skills shortages in the key areas of the business that will deliver the strategy (see L.E.K.’s Executive Insights on Skills Management). How good is the senior management team responsible for delivering the strategy? How well do they work together under pressure? What should be their individual focus on developing leadership skills? What capacity does the team have to deliver growth strategies beyond “business as usual”? An important aspect of answering the “means” question is to work out how much financial firepower is available for strategic development. Capital is often available to fund value-creating strategies, but there are always practical constraints on the cash at your disposal. There is also no point in developing a strategy that pitches your company into a spending war against better-funded competitors. It should be possible from the preceding four steps to define your strategy as the high-level plan to move from a clear starting position to a measurable endpoint, taking into account the means that you have available and the nuances of context and history that will influence successful delivery. We are not talking about detailed action plans; those come later during the activation phase. The strategy needs to define the overall architecture of the plan and the principles you intend to follow. To return to the example of the charity walkers, they will proceed on foot, using pathways that take in good scenery and using the shortest route that includes facilities such as cafes and pubs and a place to stay overnight. 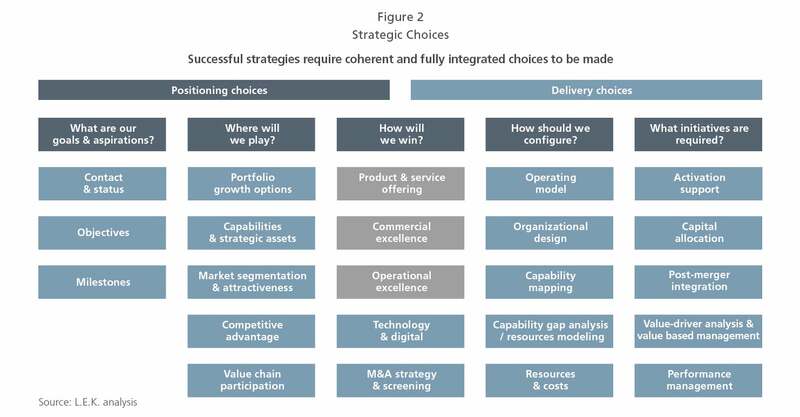 Strategy is all about choices — coherent choices that fit into an overarching plan to reach an objective. We often use the diagram in Figure 2 to illustrate some of the headings that are important in creating a coherent business strategy. Not all of them need to be under consideration every time, but each of the choices made must be consistent with the overall strategy. As a result, the high-level plan must be in place before making the choices that are relevant to the strategy being created. Your strategic choices need to be coherent; they must optimize the business model you adopt for the assets at your disposal and the strength of your management team, and make full use of your predictions for the external environment. A balanced focus on all these elements is vital. 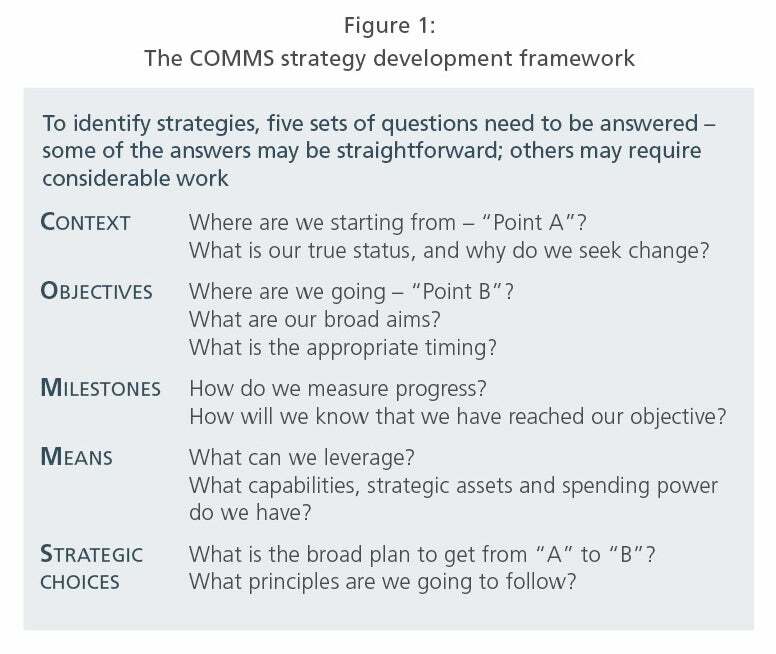 Following the COMMS framework will allow you to address the relevant questions when formulating a strategy. The acronym itself is a reminder to communicate your strategy widely throughout your organization. Everyone needs to understand the plan, feel committed to it and know the part they will play in the delivery. 1Kay, J. (2007) The Foundations of Corporate Success: How Business Strategies Add Value. Oxford: Oxford Paperbacks. China’s private education market is large and growing quickly, at $260bn (RMB1.6trillion) and set to grow at 9% year-onyear until 2020.